§ 1. The first point to be remembered in the history of the English language, is that it was not the primitive and original tongue of any of the British Islands, nor yet of any portion of them. Indeed, of the whole of Great Britain it is not the language at the present moment. Welsh is spoken in Wales, Manks in the Isle of Man, and Scotch Gaelic in the Highlands of Scotland; besides which there is the Irish Gaelic in Ireland. § 2. The next point to be considered is the real origin and the real affinities of the English language. § 3. Accredited details of the different immigrations from Germany into Britain.—Until lately the details of the different Germanic invasions of England, both in respect to the particular tribes by which they were made, and the order in which they succeeded each other, were received with but little doubt, and as little criticism. Second settlement of invaders from Germany.—A.D. 477 invaders from Northern Germany made the second permanent settlement in Britain. The coast of Sussex was the spot whereon they landed. The particular name that these tribes gave themselves was that of Saxons. Their leader was Ella. 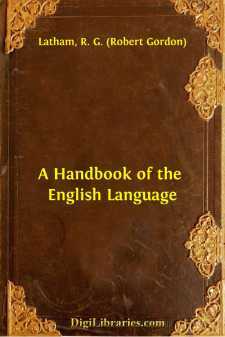 They established the kingdom of the South Saxons (Sussex or Suð-Seaxe); so that the county of Sussex was the second district where the original British was superseded by the mother-tongue of the present English, introduced from Germany.